John Mahoney, a Team In Training (TNT) cycle coach, originally decided to take on the challenge of a century ride, planning on doing it once. Then, at the Inspiration Dinner, he heard a mother speak about her son, who was diagnosed with blood cancer at age two. That's when he realized that even an 80% survival rate was not good enough - and he decided he'd be continuing with TNT until a cure was found. In 2003, he met a 12-year-old girl named Nicole who had been diagnosed with Hodgkin's lymphoma. John decided she would become his honored hero. Nicole remains cancer-free today and will soon be graduating from college with a degree in nursing. She plans to specialize in pediatric oncology. 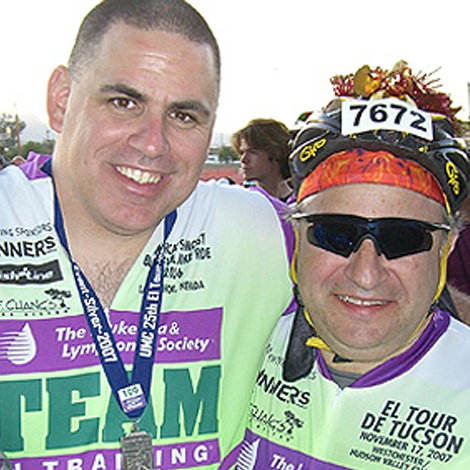 Says John, "I will continue to ride until our mission is complete - finding a cure for blood cancers!"